Hey guys! I have a few Pure Ice duos to show you today! These are the "Strobe Light" and "Strike a Pose" crackle duos. 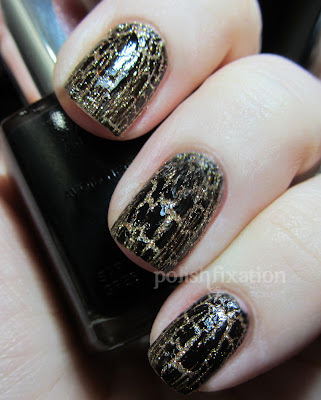 The Strobe Light duo consists of the black crackle polish called "Strobe Light" and the gold glittery polish which, sadly, has not been given a name. It's simply "582CP" (I even contacted Bari Cosmetics to double check the lack of name, and the representative confirmed that the polish does not have an official name). The glitter is really pretty and if you view the pic at full size you can see that there are red shimmer hints in with the gold. The black crackle works very well, and I didn't have any trouble getting it to perform to my expectations like some crackle polishes tend to. The Strike a Pose duo consists of the turquiose crackle polish called "Strike a Pose" and the silver glitter polish called "Beware". As with the above duo, I had no problems at all with this crackle polish. The application was simple and 1 thin coat covered suitably and crackled as it was expected to. Overall I would definitely choose Pure Ice crackles again for some of the other colors they have to offer. 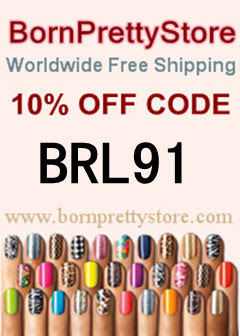 Their product is one of the better ones that I have tried in the crackle polish market. What do you think of these duos? Do you think crackle is making a come-back lately? I'm not sure about the crackling making a comeback. It can seem that the crackle-case i gone, but who knows? I like the Strike a pose duo best! Ooh, it drives me batty when polishes don't have names. Totally feel ya on that. ;) The turquoise crackle is really pretty. I've never been a huge follower of the crackle trend but I'd make an exception for that one.